October is one of my favorite times of year. For starters, it’s finally cooling off enough to enjoy being in my shop. Summer temperatures can go on well into October down here in Houston. It’s also costume and prop season, which means lots of things to do in my shop. Halloween driving most of that, but the fall months also hold host to the famous Texas Renaissance Festival just north of the Houston area. Every weekend during Renfest has a different theme, and everyone is encouraged to dress accordingly. 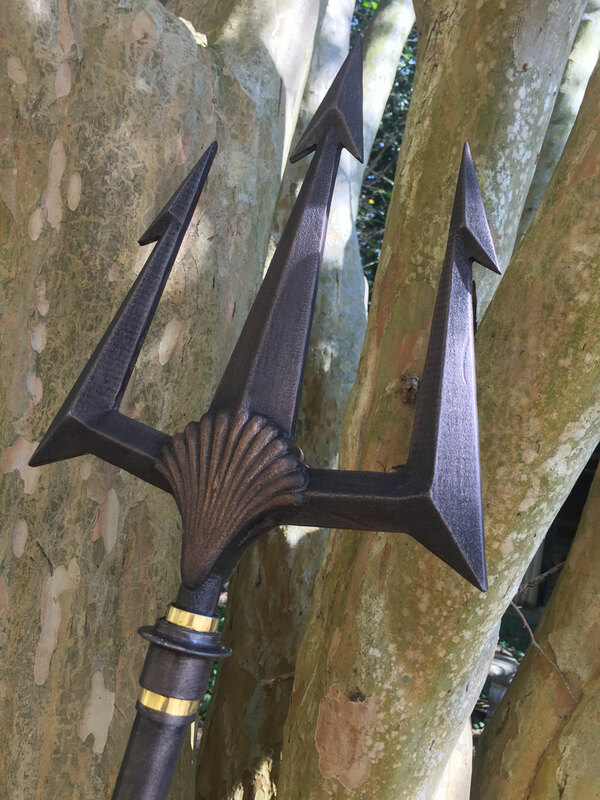 I was unable to attend this year, but a group of friends were attending the Roman themed weekend, and one of them asked if I would build a trident for his Neptune/Poseidon costume. I was happy to oblige and sat down and designed him one real quick. I used MDF for the material. It was on hand and it is easier to work with at the widths I needed. 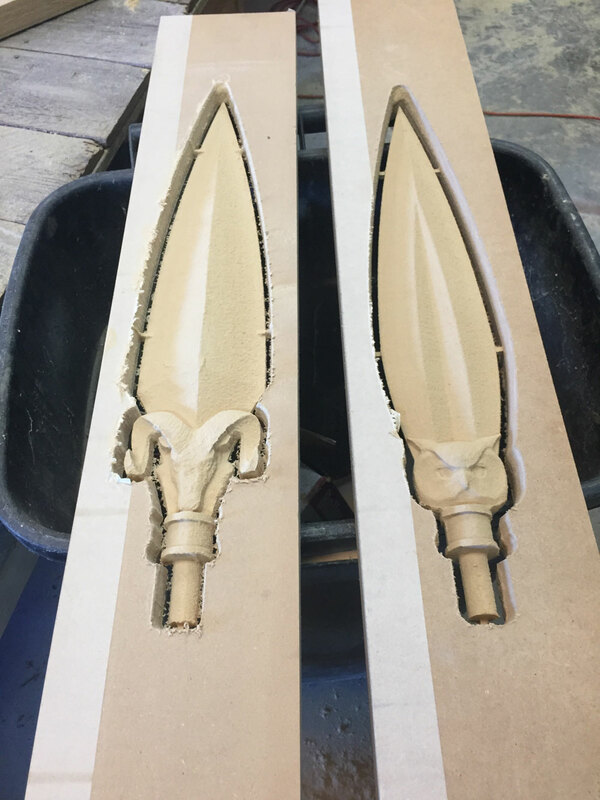 I glued up to 3/4″ boards to make it 1 1/2″ thick and loaded it in the CarveWright to run my project. When finished, I removed the tabs and did some light sanding before I applied a sealer. I was worried about it being delicate so I tried a Minwax wood hardener as my sealer. This worked really well and soaked in far more than my usual shellac technique. Once the sealer was dried, I did a little more aggressive sanding before applying paint. I wasn’t worried about making it perfectly smooth with the paint I chose for the job. 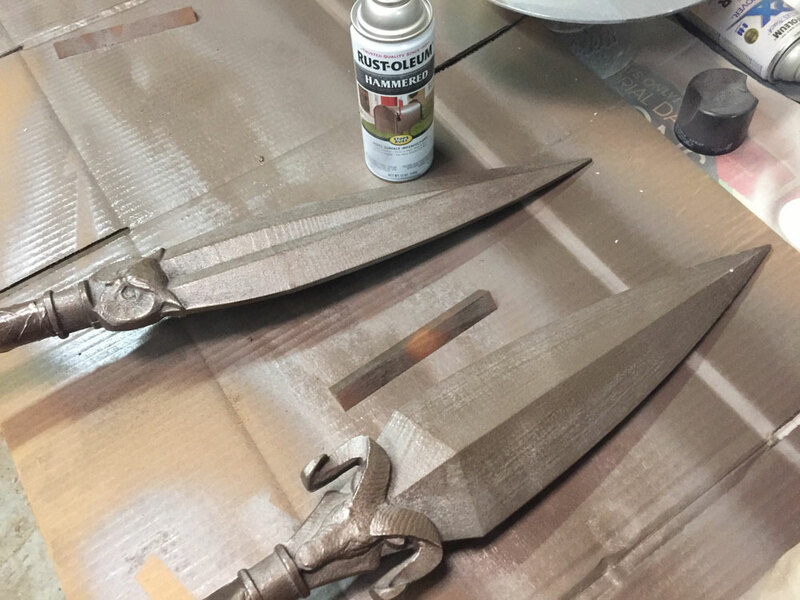 I wanted to make the piece look bronze, so I started with a brown hammered metal spray paint from Rustoleum. 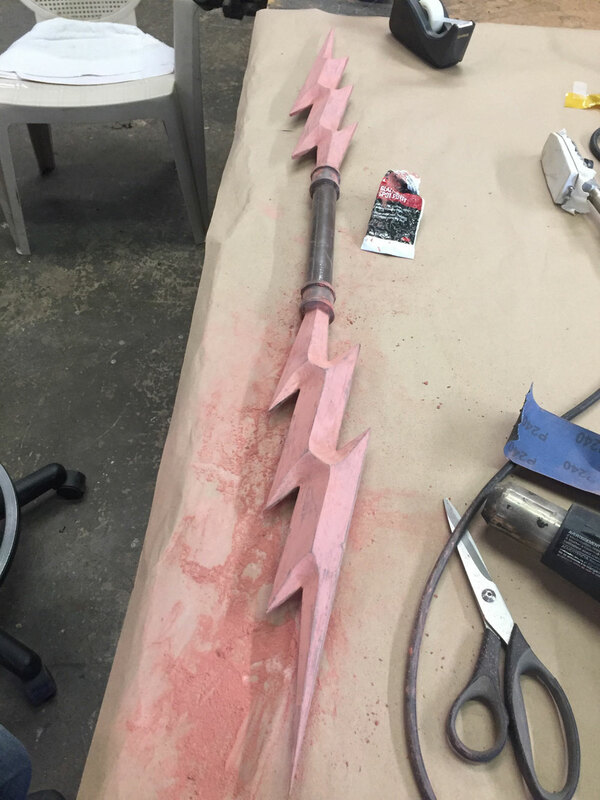 I painted the Trident and the 5 foot metal conduit I picked up for the handle. Next, I assembled the 2 pieces together and added some decoration. I wrapped an old belt around to make a grip and used some found items to complete the look. I applied a black wash over the entire piece and dabbed the paint while wet to give it an aged look. Not bad for a quick project. When I showed this to my friend, he was thrilled and, quickly, sent pictures to the others attending the Renfest with him. That’s when I started getting the phone calls. 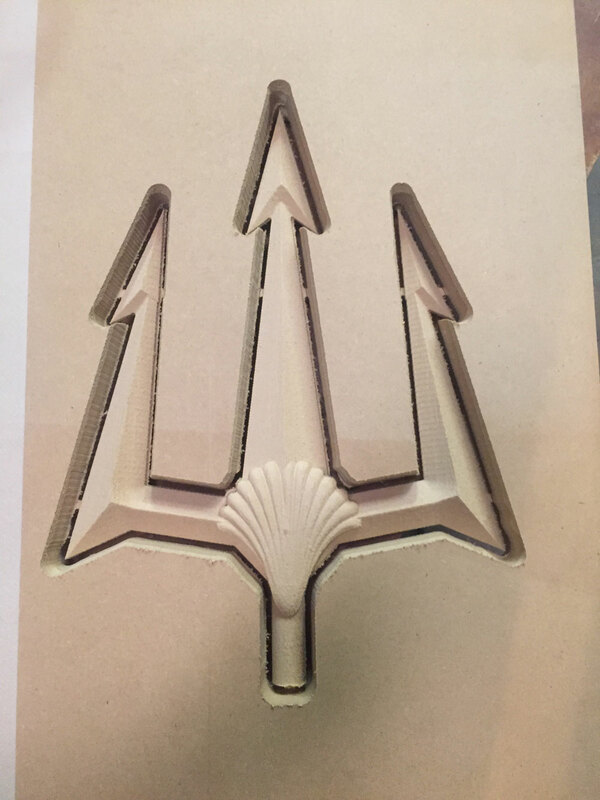 I had already decided to include the Trident in a Halloween props blog, so why not just make this the entire blog. 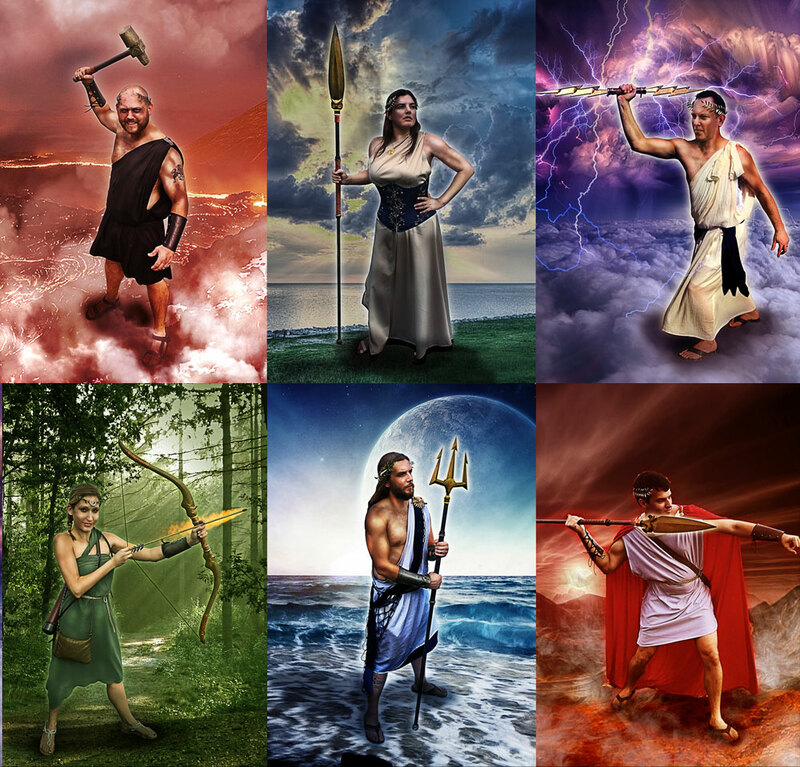 Now, I need to make a spear for Mars (Aries), another spear for Minerva (Athena), a lighting bolt for Jupiter (Zeus), a hammer for Vulcan (Hephaestus), and a bow for Diana (Artemis). 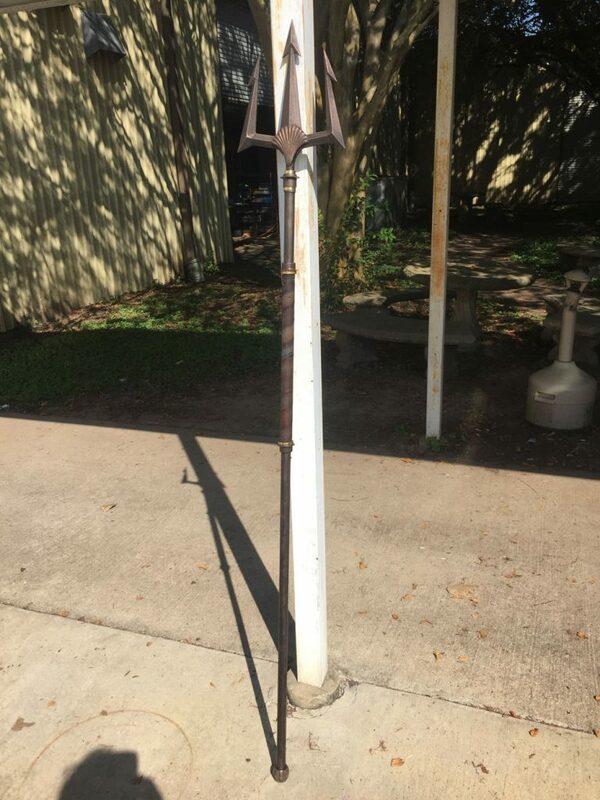 The spears were designed basically the same way the trident was. Draw a quick shape and use the puffing tools to create dimension. Like the trident, I wanted to include a symbol to help represent the deity to which it belonged. An owl representing Minerva and a rams head for Mars. 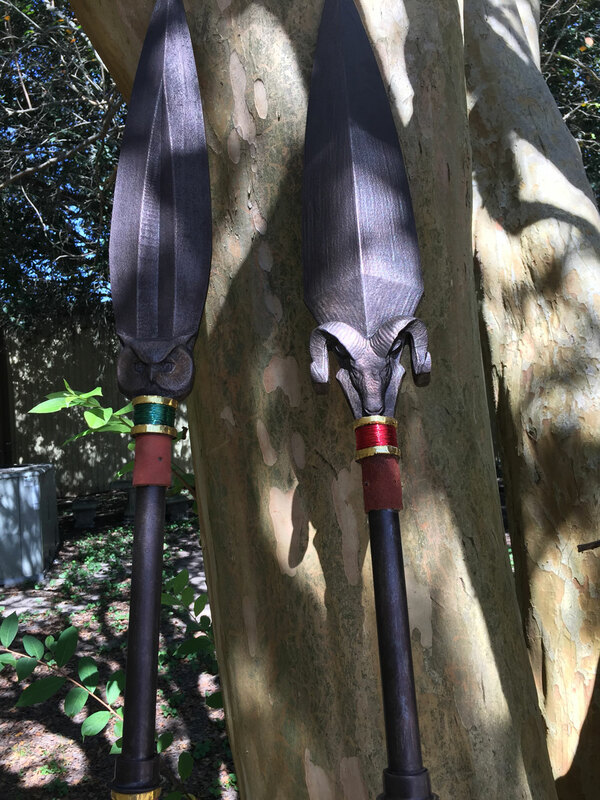 With the spears designed, I uploaded them and got them carving. 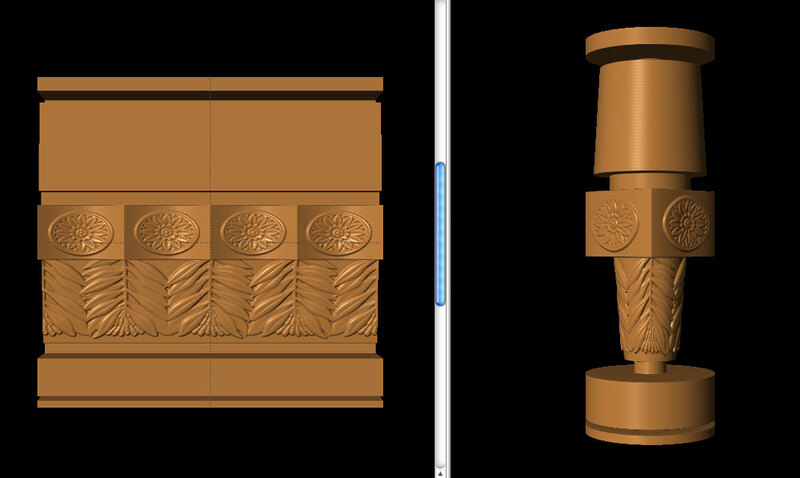 I have 2 CarveWright machines, so I could carve these at the same time, while I designed the next pieces. 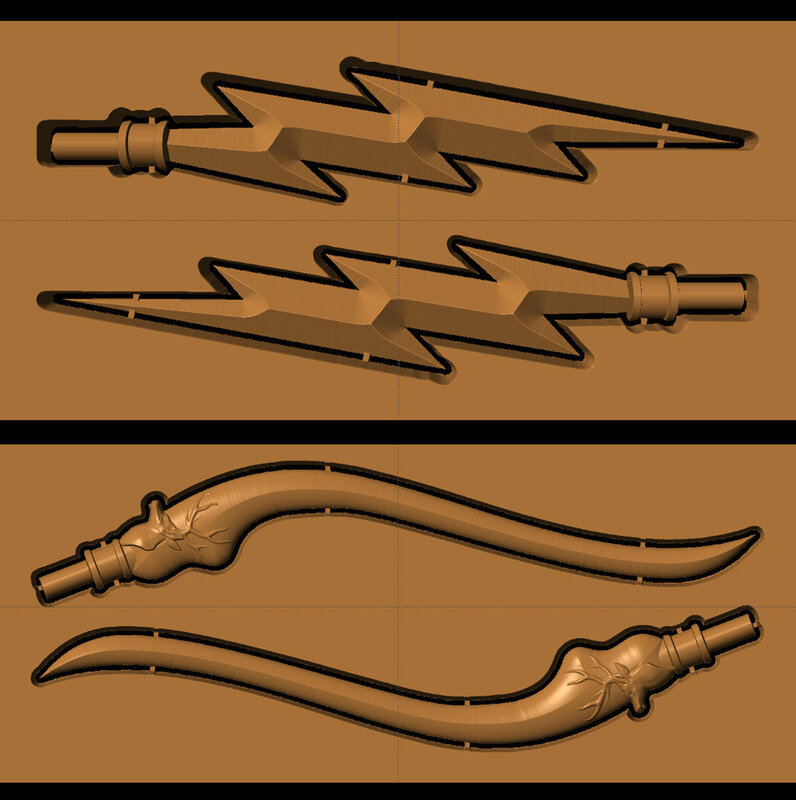 The lightning bolt and bow were pretty similar in size and method of assembly. I designed them at full size, first, to see how the finished piece would look. For building these, I decided to use a piece of PVC for the handle in the center, and prepared the files for carving and uploaded them to memory cards. 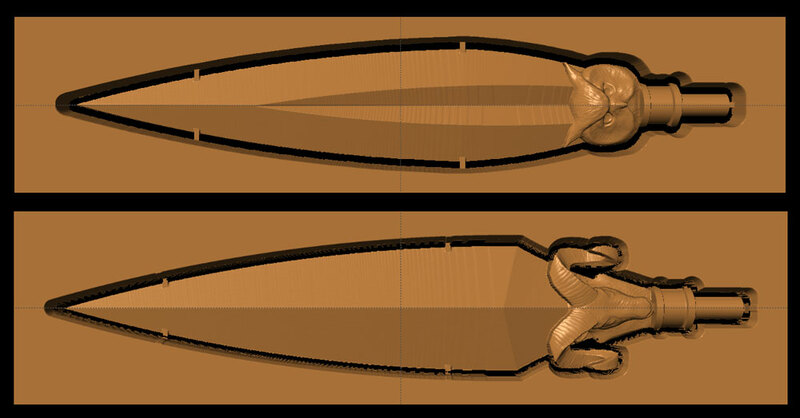 When the spears finished carving, I pulled them out and loaded in the bow and lightning bolt. 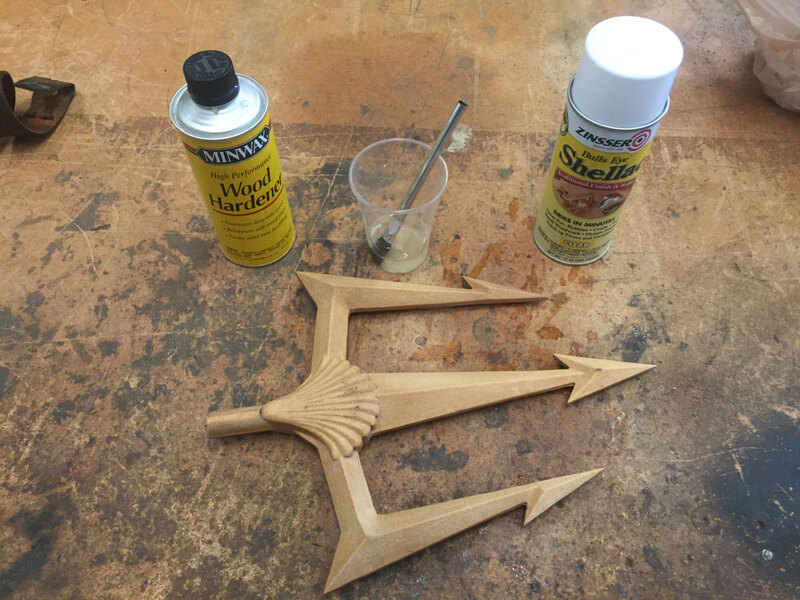 The wood hardener worked well on the trident, so I followed the same procedure for preparing these pieces. This time I prepared the rods ahead of time with the wrapped leather handles and all. TIP: If you need some leather for a project like this, head down to your nearest Goodwill or Thrift store and buy some belts. I masked off the leather and made ready to spray paint. 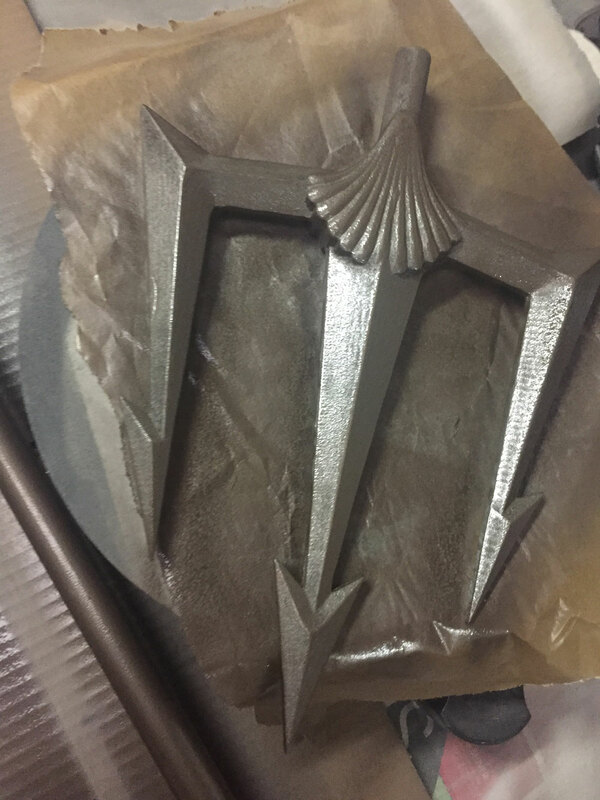 Once again, I used the hammered metal brown paint to give it a nice bronze base coat. When that paint dried, I applied my antiquing wash and added some brass tape and copper wire to finish them off. 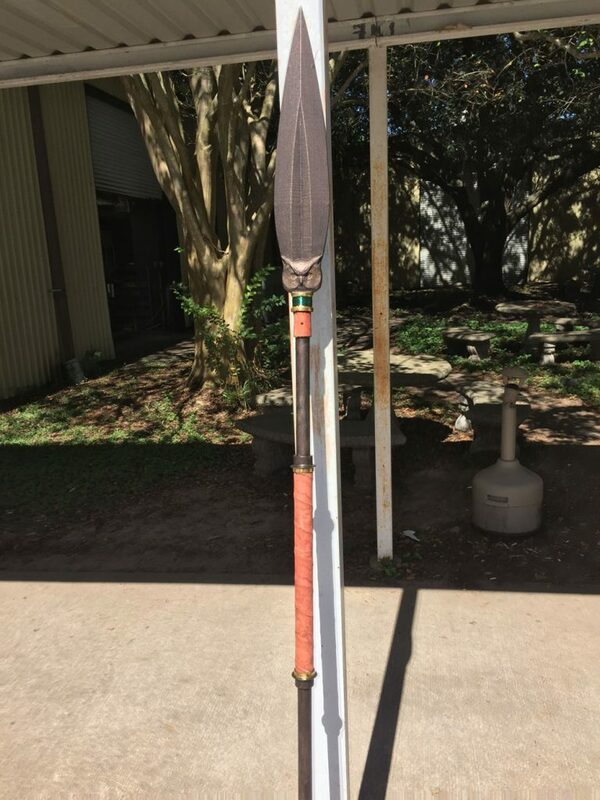 With the spears finished, it was time to get the hammer designed to load when the bow and bolt finished. I decide to do this on the Rotary jig. It’s a pretty simple shape, so I added some decoration to make it more interesting. The bow and bolt finished carving toward the end of day, so I waited for morning to load the hammer. It was only a 4 hour carve, so it could be done by lunch. 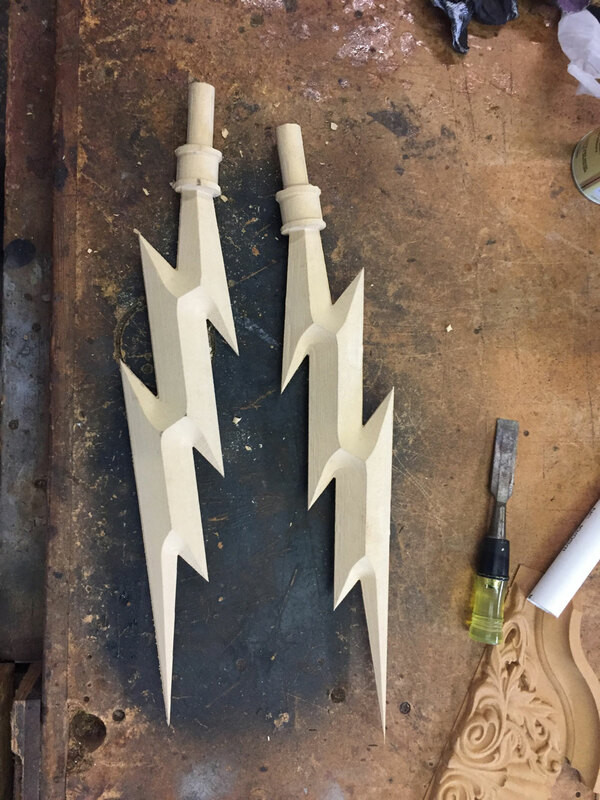 In the meantime, I started on the lightning bolt. I separated the pieces and cut my PVC piece for the handle. 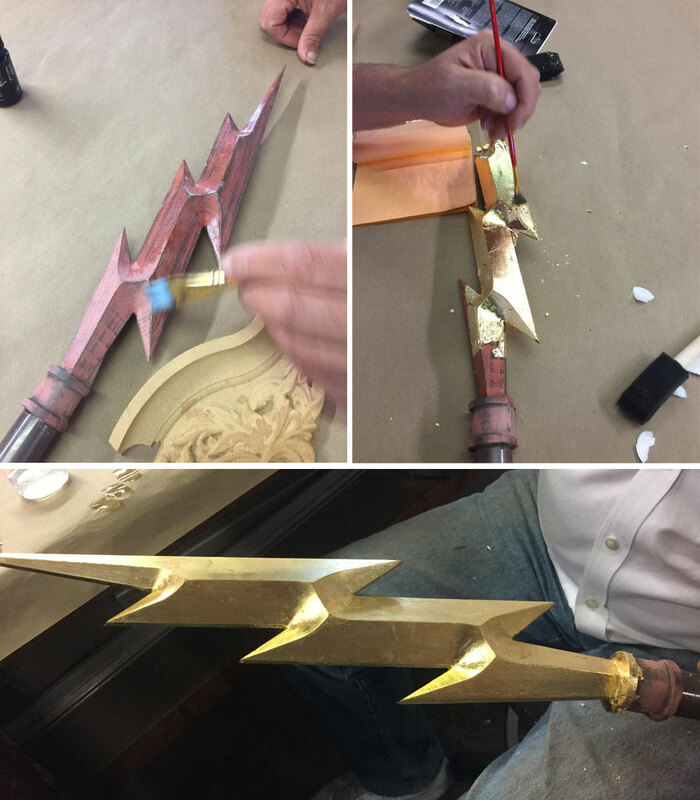 I really wanted the lightning bolt to be shiny gold, not a paint gold, which is never gold enough, but a real golden sheen. I went down the art store and picked up a gold leafing kit to give that a try. One thing that was clear, if I wanted to get this piece shiny, it needed to be really smooth. 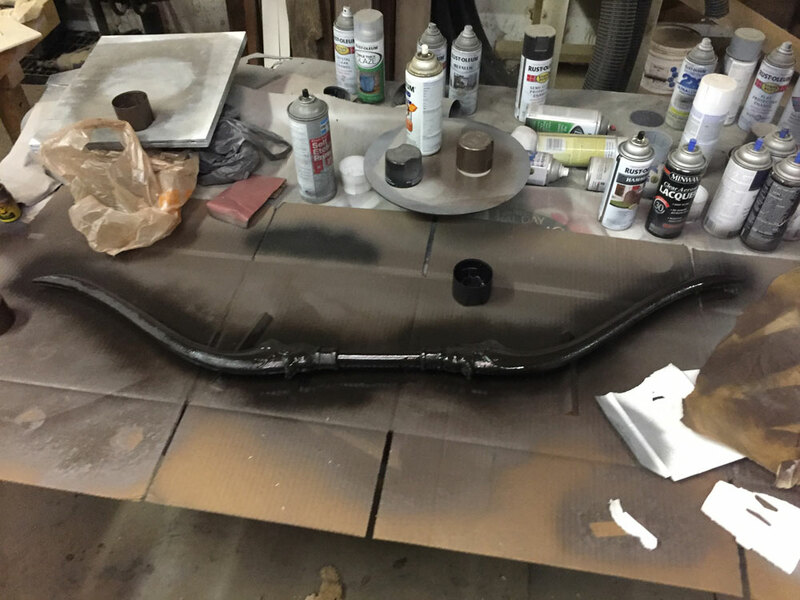 I used my trusty bondo filler and got to work filling and sanding. Once the surface was prepared, I applied the gold leaf sizing and gold leaf. Another belt, some brass tape, more copper wire, and the lightning bolt goes to the finished table. 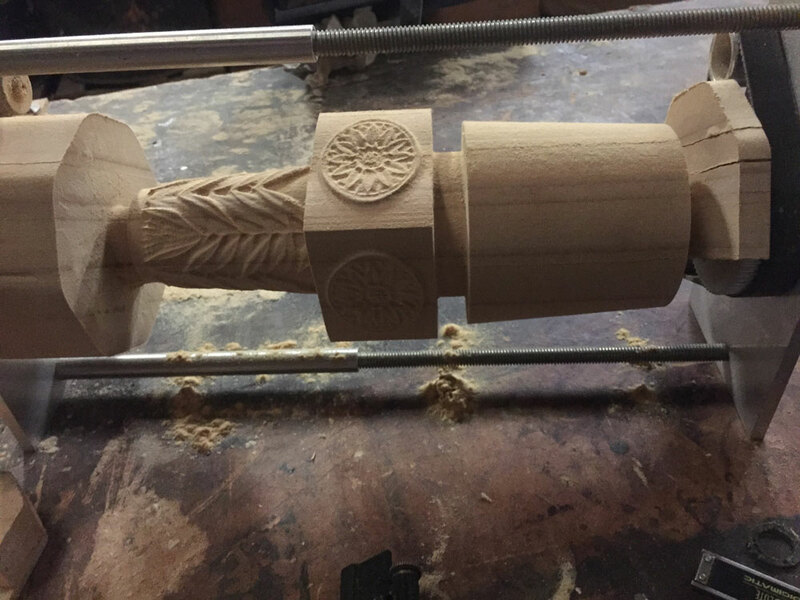 At this point the hammer had finished carving. That’s the last of the carving needed! 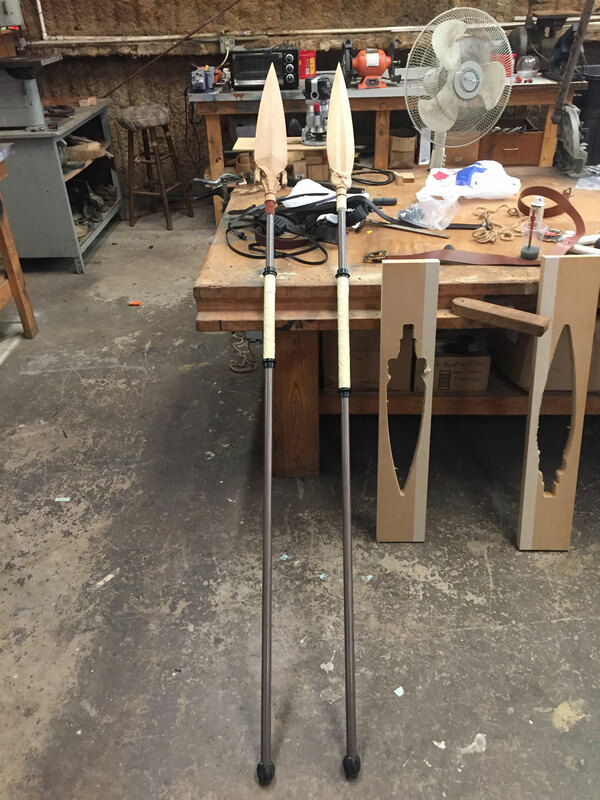 I worked on getting the bow separated and then got both of these sealed with the wood hardener. 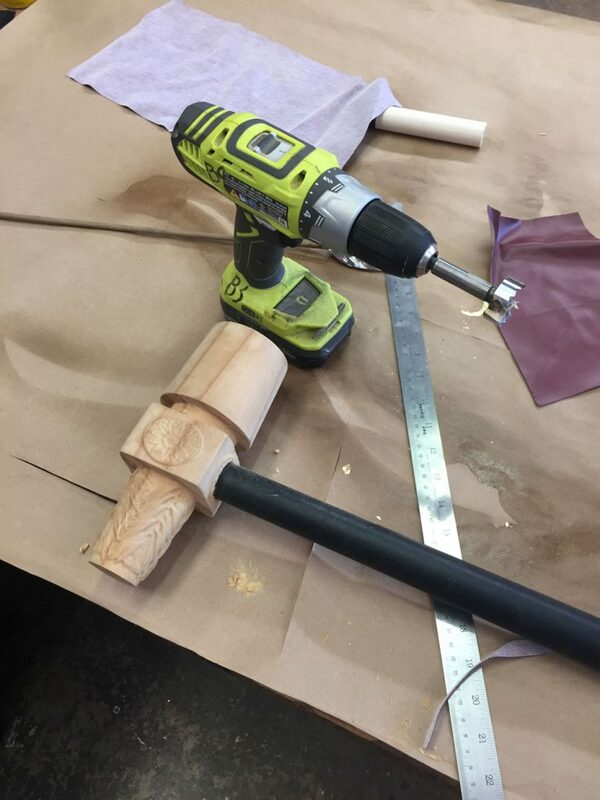 I used a forstner bit to put a hole for the hammer’s handle, which was actually an old vacuum attachment extension. With the hole drilled far enough, I used epoxy to glue it in. Next, I glued the PVC handle to join the bow pieces together. 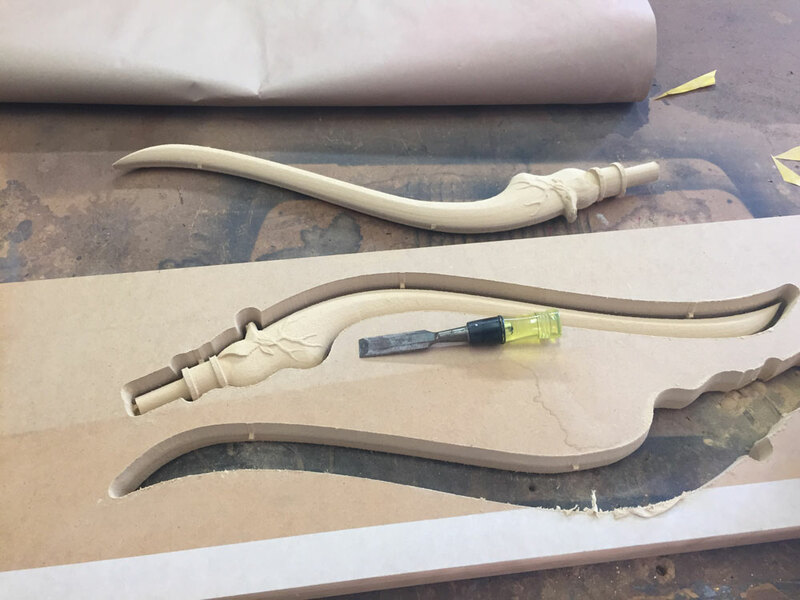 Now, both pieces are ready for paint. 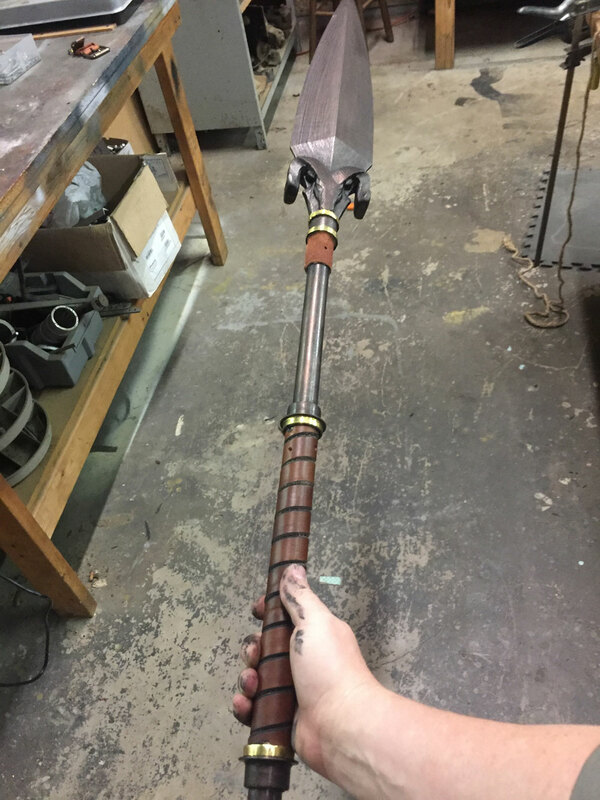 The bow and the handle of the hammer should be wood, so I used a satin brown paint I had lying around to give them base coats. 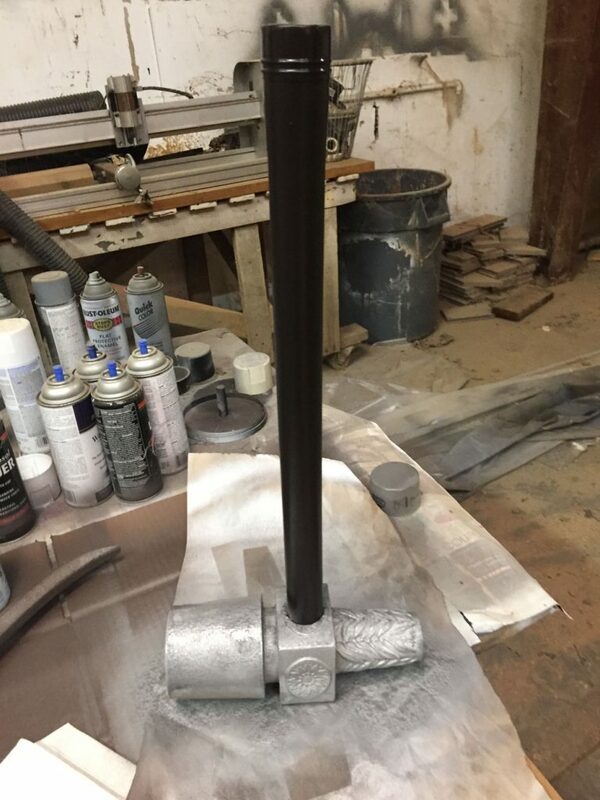 I decide to make the hammer look like iron, so I gave it a hammered metal silver base coat. 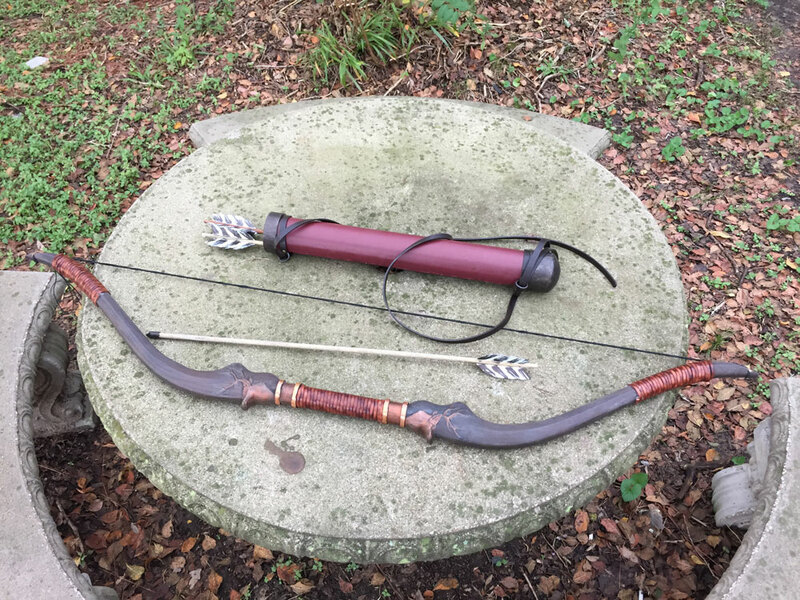 While waiting for paint to dry, I decided I needed a quiver and arrows for the bow. 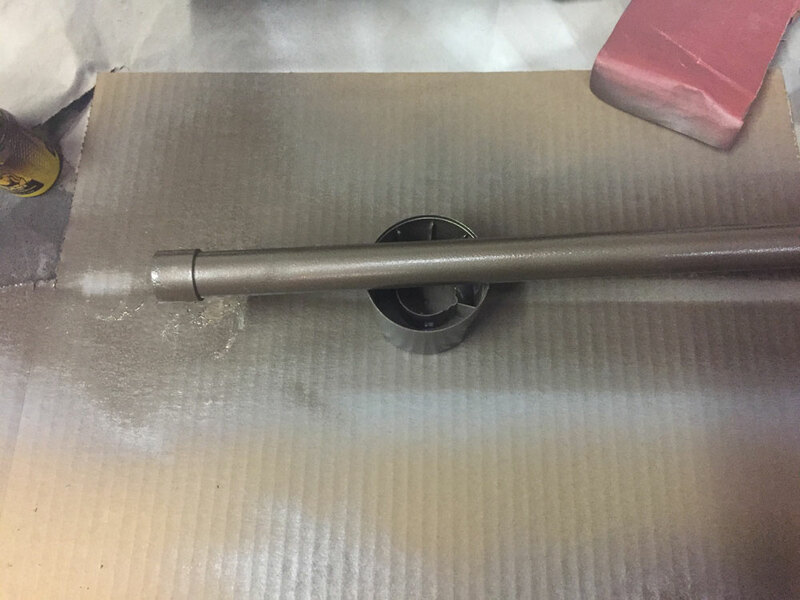 I found a long piece of 3.5″ PVC that had a cap on one end. I gave it my bronze treatment and wrapped it in some red faux leather I had. Then I rounded up some misc. dowels and some thin plastic material to make into arrows. 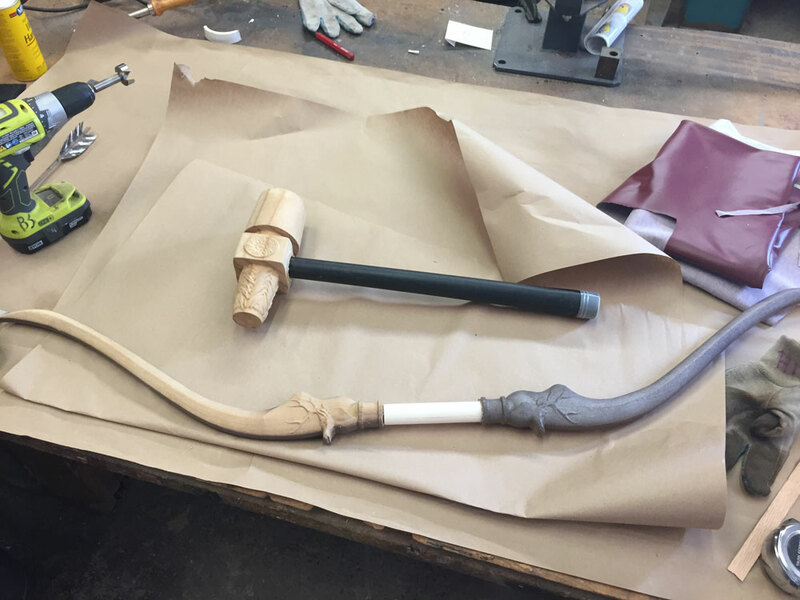 Once the paint was dry on the bow, I finished it with some leather and some elastic string. 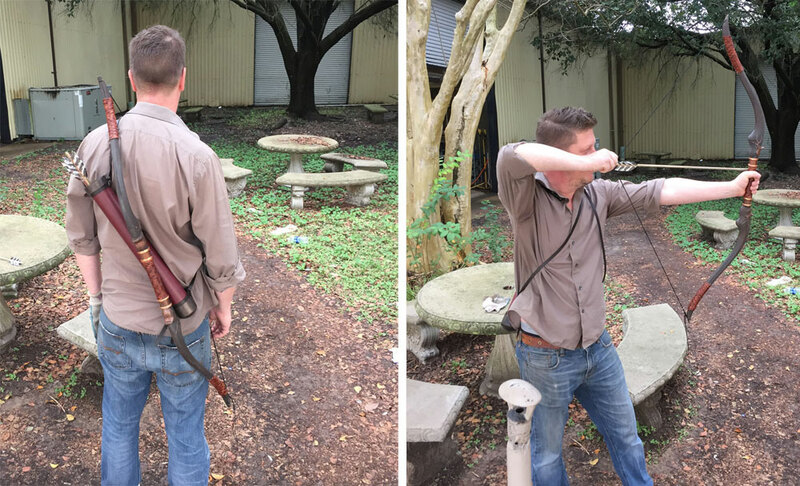 You could actually shoot it! Although, don’t plan on hitting what you’re aiming at. 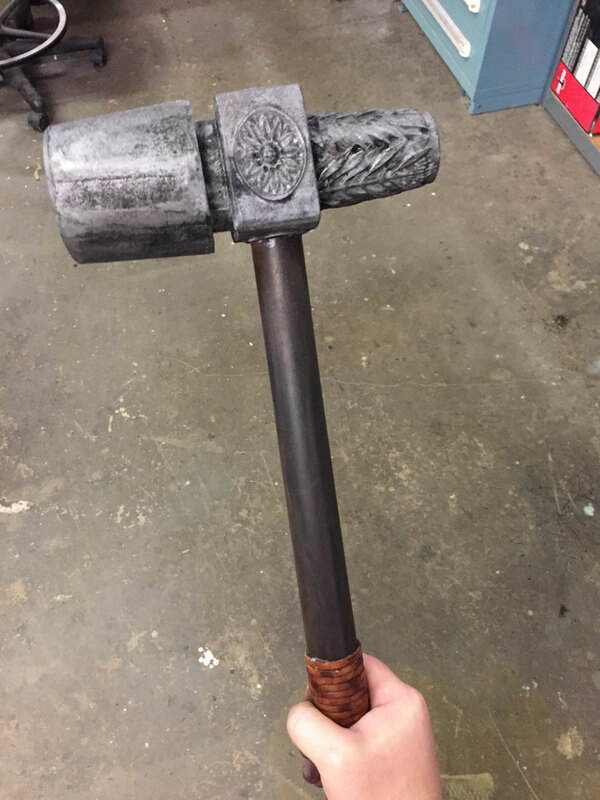 The hammer just needed some aging with black paint and it was ready to go, as well. 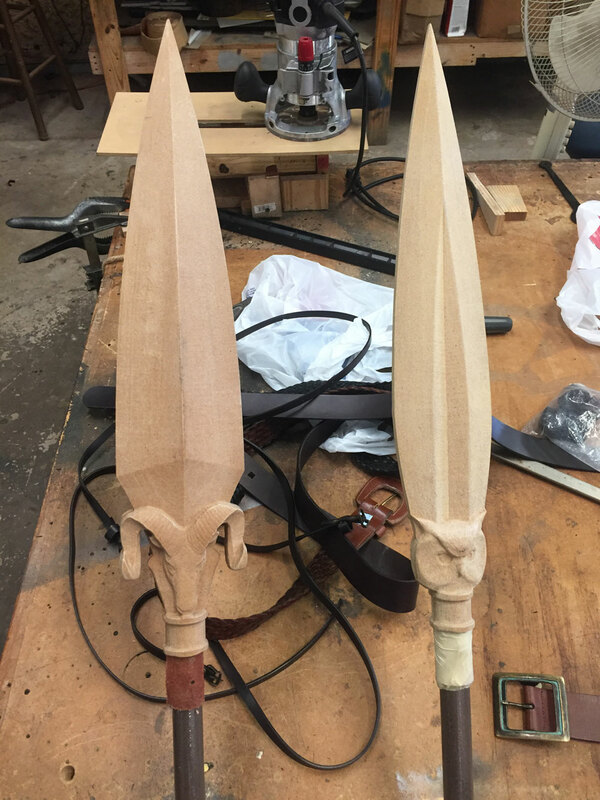 The weapons of the gods were finished in about 4 days. Just in time for the renfest weekend. 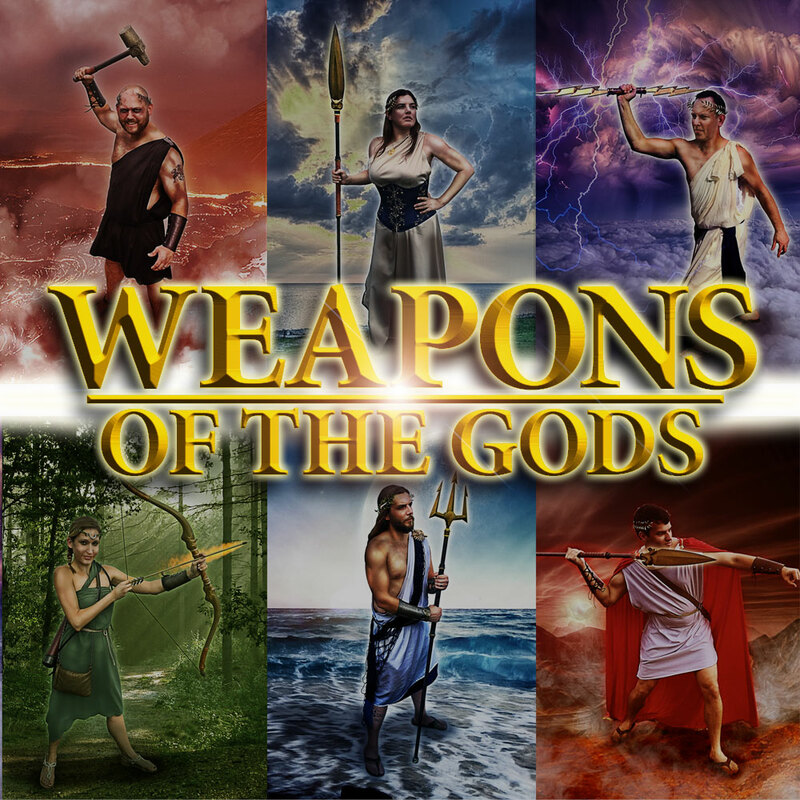 They all had a great time and sent me photos of each posing with their weapon. I couldn’t help myself and touched the photos up a bit. Want to try these projects yourself, or just want to take a look at the settings? Download my project files below and enjoy! Projects do require Project Designer PRO v3 and some features will not be accessible without the Pattern Modeling Suite. It looks to me someone was having too much fun. But I will say one heck of a great job!! Awesome job! Loved them all and appreciate the insight into the creation process! 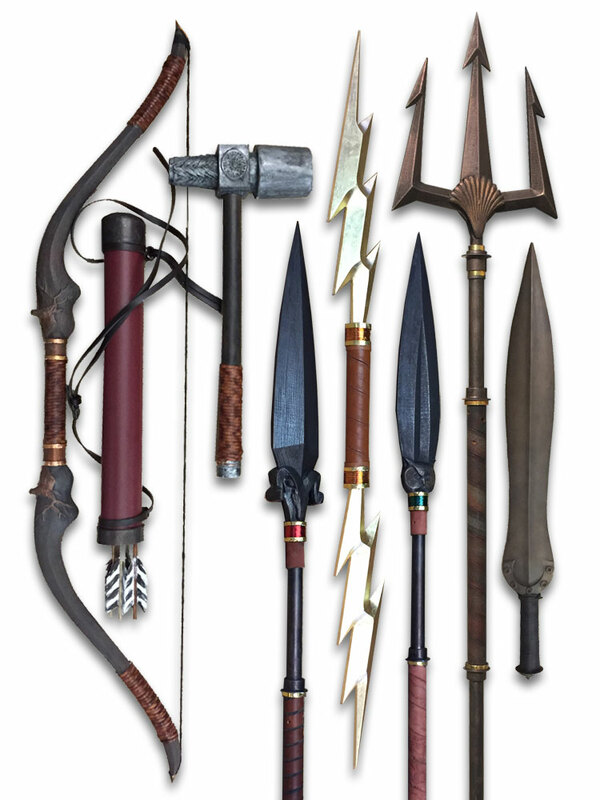 awesome weapons, sounds like they were fun to make and turned out to be very useful as well. Pure awesomeness!! Wow! Fantastic work all around. I’ve used the MinWax Wood Hardener too. It’s been years though – thanks for the memory jog. It works great on MDF and softwoods. A most enjoyable blog post!